Olympia, Washington has so many beautiful spots and places to go. This last weekend, my upper New York snowbound-in-winter sister Kate and I went there for an adventure. She’s the youngest of the seven Harrington siblings and lives outside Syracuse, New York. 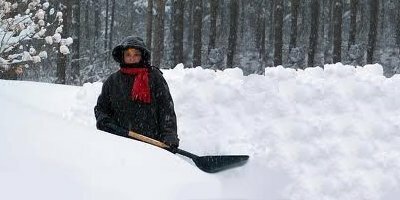 Her family lives in an area that has Lake Eire weather pattern of heavy, heavy snows that fall early and take a long, long time to melt. She had come back to Tacoma to visit her daughter Marie who lives in Issaquah and the rest of our family. We had reservations at Budd Bay Café at 12:30 and at Splash Gallery at 2:30. We were early, so first we went to Orca Books. The Harrington family women are all bibliophiles. We love libraries and book stores. Orca has both kinds, new and used. I bought a book by M.F.K. Fisher, The Gastronomical Me, a memoir-cultural study by a woman who travelled France, tasting, commenting, and enjoying the food and culture. She wrote numerous, humorous books that I’ve read but Kate never had. She started reading when we got home and decided that she was going to enjoy Fisher. Then, we went to lunch at Budd Bay Café. Budd Bay Café has a beautiful view of the bay and marina and also feature wonderful seafood. Kate was really hungry for Dungeness crab, missing it since it rarely and then only very expensively makes it to upstate New York. Unfortunately, the Crab Louie didn’t have the concentration of crab that she wanted but we were both happy with our lunch choices. We both had wild-caught salmon, our favorite fish, in two different preparation methods. 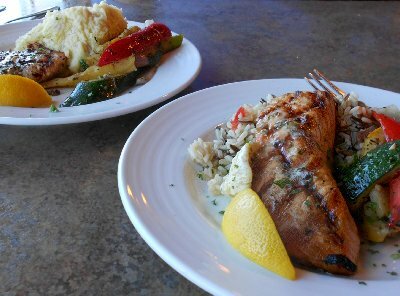 Mine was grilled salmon with tri-citrus butter on rice pilaf and stir-fried zucchini, yellow summer squash and crisp red pepper strips: moist succulent salmon and great veggies. Kate had the apple-wood smoked salmon with Yukon gold mashed potatoes and the same stir-fried veggies, but preceded her salmon with a cup of Budd Bay’s rich and satisfying clam chowder with sourdough bread. Sourdough is difficult to come by in the countryside adjacent to Lake Erie. We need to find the best for her to take home. Her family loves sourdough bread. After lunch we went to the Last Word bookstore. There we found a used version of the M.F.K. Fisher book I had just bought new at Orca, so Kate had a copy as well to read. Good times and bookstores go together. Then it was time to go to Splash Gallery, at 501 Columbia St. NW, not 50 feet from the Budd Bay Café. 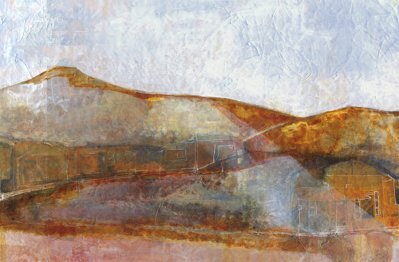 We met with Marina Kuran, a watercolorist and author (Under the Ulu Tree and a poetry book, Thirsty Moon); she’s one of the 15 artists now in the gallery co-operative. They all participate in running the gallery and changing the pieces. 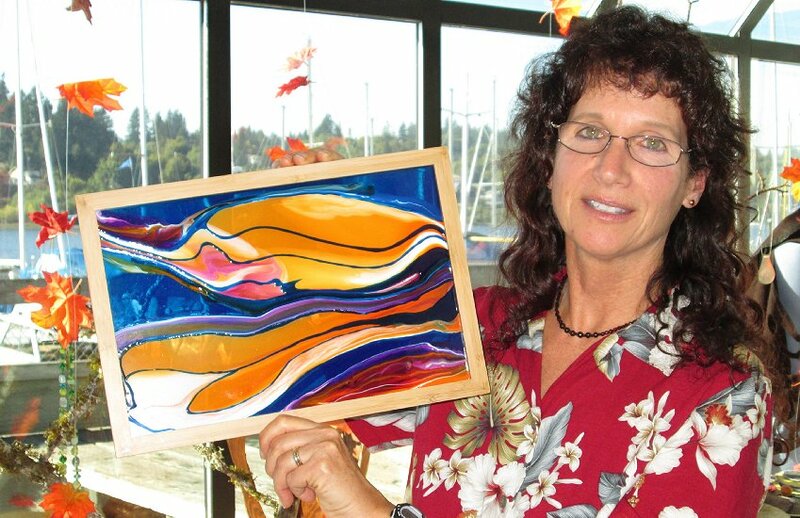 Marina paints abstract landscapes, both in watercolor and on glass. The glass pieces are on display in the huge window at the back of the store where they get the light from the marina. Good planning. 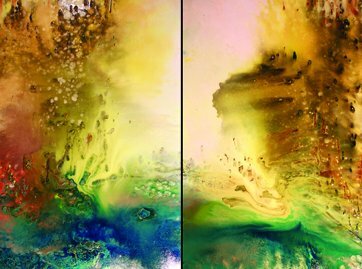 When Kate and I first walked in, we looked at paintings in the entry way and said, “Those must be painted on glass; they seem to glow like reflections on water.” But no, Thomas Boatright’s paintings are oil on canvas; he manipulates the oils with chemicals to get the liquid effects he wants. Further into the room we saw exquisite wood lathe and inlaid wood pieces by Larry Boatright. 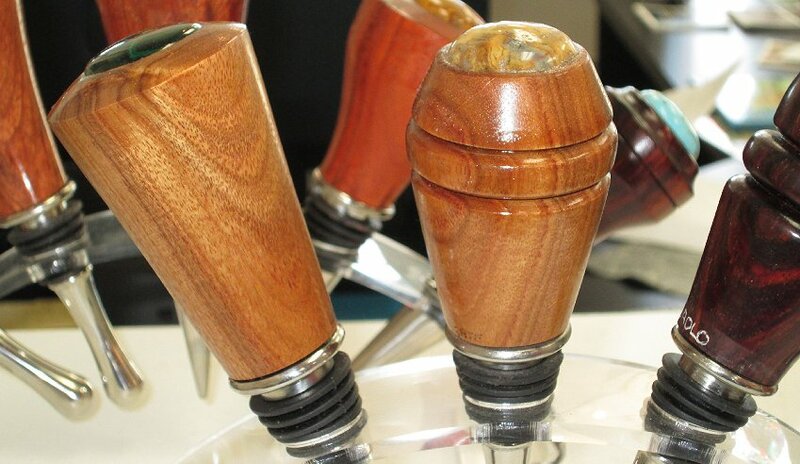 We really enjoyed the beautiful details of the wooden wine stoppers. He had several pieces, including a striking, large inlaid wooden vase with wooden cattails. In the display case, I really admired Jan Sogge’s sterling silver jewelry, currently featuring heart motifs. A heart is one of my favorite pendant designs; I know they are egregiously romantic, but then, so am I. 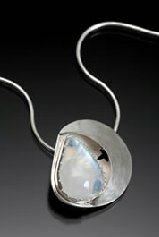 They vary from very small to larger, polished shiny silver to almost pewter gray, smooth to chunky – beautiful and diverse. She also works with lamp worked beads in necklaces. I told Don about them with an eye to my upcoming birthday! We particularly enjoyed the cool blue-greens, purples and gold of Kim L. Merriman’s iridescent hand-make glass and hanging brushed aluminum pieces. 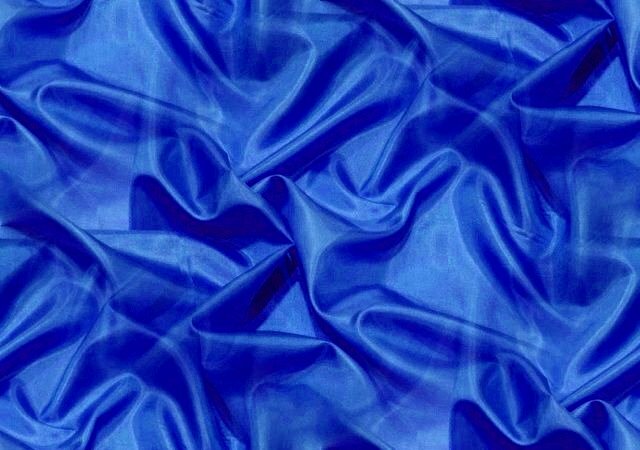 The small beads riding on the crest of the waves of solid color were luminescent. 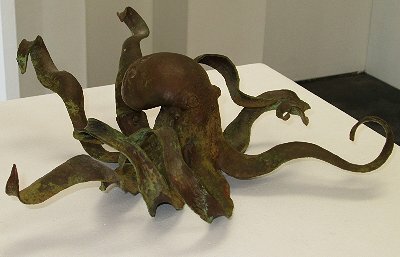 Kate particularly enjoyed a metal sculpture of an amusing wavy-legged octopus by Travis Conn. He had several other pieces on display as well. One of my favorite artists there was Janice Arnold. She works with textiles, handmade felt woven and sewn into several different types of clothing. I loved her Grandma’s Attic collar piece, using repurposed lace and felt. It had a wonderful organic, vintage spirit. Christine Malek wove little nests with small birds or other creatures in them. She started with a cord or maybe metal wire base, woven with torn fabric strips and decorative yarns. She also produced whimsical hats, including an inverted beet or radish, with green leaflets around the border and a long red radish tail poking up into the sky as well as a close-fitting hat with bear cub ears. Kate insisted I model the radish hat, knowing my predilection for enjoyable, goofy looks. I love funny. Robin adopted her daughter from China and, as time went by, realized the girl was becoming ashamed of her heritage. 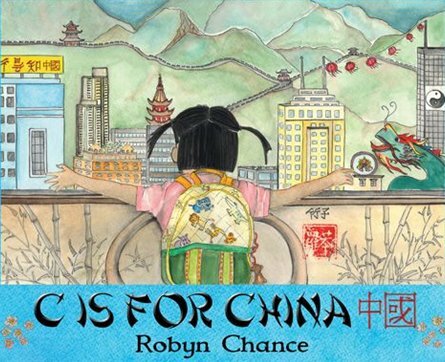 Robyn wrote the book to emphasize the wonderful outlook and enchanting colors of her native land, which she has come to be proud of. Kate and I had a wonderful time, chatting, photographing and being inspired by the colors, textures and tactile surfaces we saw. The Splash Gallery is at 501 Columbia Street NW #C in Olympia, Washington. Stop in for a refreshing look at beauty and art. Olympia adventure tour, lunch at Budd Bay cafe Olympia, Splash Gallery Olympia, Olympia WA Washington.